Since 1978, we have been celebrating National Grandparents Day on the first Sunday after Labor Day. This year that day falls on September 11, 2011. There are many ways that families honor grandparents on this day from making cards to planting trees. As my nieces were growing up, their elementary school would host a grandparents breakfast each year. There is even an official flower, the forget-me-knot, of Grandparents Day which seems very appropriate. Though my maternal grandparents are no longer living, memories of them continue to shine strong. I remember my grandma writing a telling time book for kids, her homemade apple pies and her soft flabby arms. We enjoyed opportunities with grandpa for many more years than with grandma. Trips to McDonalds, him hanging a sack swing from a tree and teaching me to drive in the horse field will rank as some of the best memories of my childhood. When I learned that I was pregnant with my son, I wanted to make sure that my child had lasting memories of his grandparents. On Mother’s Day, I purchased For My Grandchild: A Grandmother’s Gift of Memory for my mom to announce our big news. This journal allows the grandparent to write about topics ranging from what life was like when they were little to advice that they would like to pass on. My mom worked on filling in the book throughout my pregnancy and added pictures of herself and my son after his birth. There are several blank pages for photos or mementos. When she gave the book back to us, I read it from cover to cover learning some things I didn’t even know about my mom. I already treasure the completed book and know my son will feel the same as he grows up. A memory journal is a great gift to give this Grandparents Day. 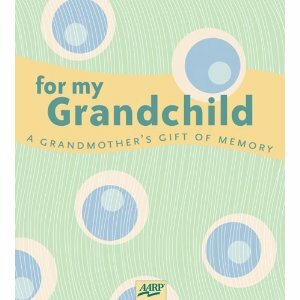 There are a variety of grandparent memory journals available at your local bookstore or online. Do you have a favorite way to preserve memories of grandparents? It is surprising how little most grandchildren really know about their grandparents. That is understandable since it is usually all about the child when they are together. As the child matures and becomes aware that adults have lives too, it is often too late to talk to a grandparent. I think some kind of “complete the sentence” journal is a great way to get a grandparent to tell their story in their own words. My mom has not only written down memories of her life, but has written down memories her parents told her. It’s a great feeling to hear my children retelling stories about their great grandparents whom they never got to meet. One of the last things my grandpa said was, ” don’t forget me.” Through these stories, no one will.